Three things I love: infographics, online communities, and politics. So when I came across an article in Mashable about groups of programmers who had come together to design online tools for the Occupy Wall Street movement, I was intrigued. Developing a unified set of visual ideas for a political cause represents how offline community building leveraging online capabilities to spread ideas and generate organic conversation. OccupyDesign is an online database of infographics that synthesize main points being advocated by Occupy Wall Street protestors. According to their website: “We aim to provide a universal visual toolset for the Occupy movement which crosses language barriers and brings a strong visual identity to the movement.” In “building a visual language for the 99 percent,” OccupyDesign does not intend to “brand” or “design” the movement, but provide a repository of universal designs that express common concerns so that they can be used–and understood–anywhere. In helping the movement articulate its ideas, AllOurIdeas asks users to cast votes for one of two goals. 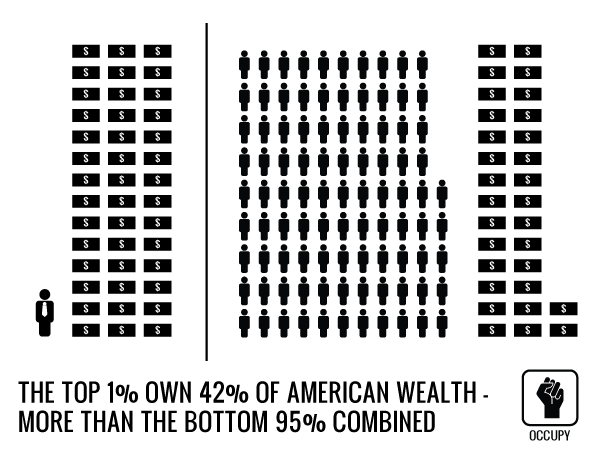 By allowing users to contribute ideas, AllOurIdeas is effectively crowdsourcing the democratic process, “enabling #OWS to collect and prioritize ideas in an open, efficient, and accountable way.” Users can view the results of individual votes, as well as in word clouds. 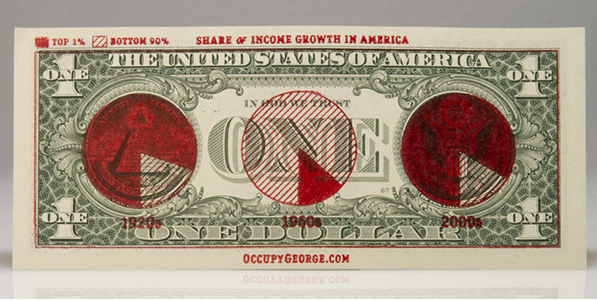 OccupyGeorge is a DIY project that circulates dollar bills stamped with fact-based infographics showing America’s wealth disparity. Because money is what this protest all about, anyway (…right?) So why not circulate the message on the medium? It’s a brilliant concept. The website is gorgeous and user-friendly, including links to sources for their information. The infographics can be downloaded so protestors can print at home (using their own dollar bills, of course). 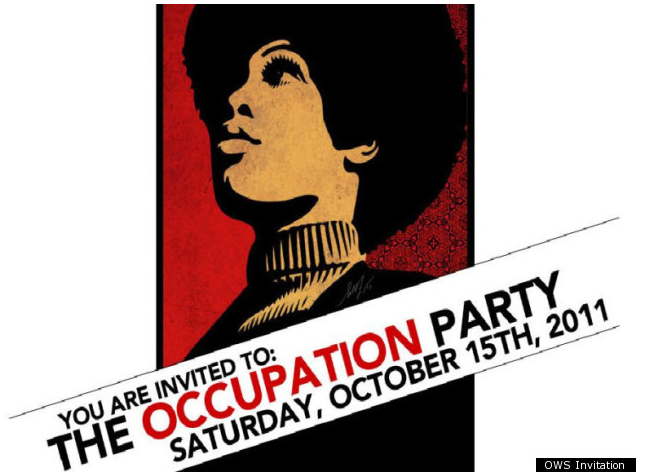 What do you think about designers creating visual language for a political movement? Are there other designers out there who I should know about? I’m fascinated by all of this. Like most of the digitally connected world, I’ve been fascinated with the outpouring of content surrounding Steve Jobs in the wake of his death. From the philosophically-driven Stanford commencement speech to a poll on which of Steve Jobs’s products mattered the most, I’ve felt inspired by his words, invigorated by his commitment to beauty and detail, sad at his passing too soon, and scared for myself. Because I feel a deep need to take action. Hunter Walker posted an article in TechCrunch that articulated what I felt I needed to do: #LiveLikeSteve. While Steve would have surely been flattered by the comparisons to Einstein, Ford and Edison, his ethos was about taking action as yourself, and not being beholden to anyone else’s standards. To #LiveLikeSteve is to #LiveLikeMe. Here’s my mantra: consistent, engaged and connected. Call it will power. Call it a to-do list. I’m calling it short-term action to achieve longer-term goals. 1) Write at least one blog post a week on something new that is inspiring and innovative. I’m giving this blog specific direction. My posts may relate to new technologies, ideas, art or music. I’m not intending the blog to be a comprehensive review of everything that’s out there, but it will present my cohesive, unique voice. I have no expectations as to what may come out of it, except knowing that I am writing about things I like. 2) Write, and respond, to questions on Quora. I want to start engaging in a community of curious people who are prominent in the tech space. It will challenge me to keep up-to-date as well as establish my own thought leadership. 3) Listen to my personal trainer. I hired him for a reason. I’m starting with him tomorrow. I’m going to stop kidding myself and get back in shape after my ankle surgery. I’m going to evaluate my progress in a few months and revise my goals based on how I’m doing. These actions may seem like small beans to some people, but I’m not going to sell myself short anymore. The greater the risk, the greater the reward, right? What are you doing to #LiveLikeSteve?